Thirty seven years ago, my wife Ethel and I sold Spray-N-Grow from our home. With full time jobs, we worked evenings and weekends. Our tiny company relied on high school students to pack orders in the warehouse (our garage) and a friend to help in the office (our spare bedroom). Gardeners across the country soon learned what we already knew. Spray-N-Grow Micronutrients produced more, larger blooms, tastier fruits and vegetables, larger harvests, and stronger, healthier plants. Scientific tests confirmed gardeners’ results. In 1985, we moved to a real office/warehouse and waved goodbye to our day jobs! A few years later, I developed Bill’s Perfect Fertilizer and wetting agent Coco-Wet as perfect complements to Spray-N-Grow Micronutrients. 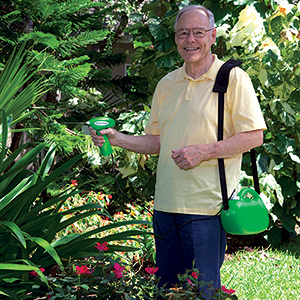 Our Spray-N-Grow catalogs feature photos that show your Spray-N-Grow success stories. They are also filled with all natural, nontoxic and organic products that are safe for people, plants and pets. My daughters, Melanie and Natalie now manage our family business. Now, their kids also work with Spray-N-Grow. I am very grateful for you − gardeners who love Spray-N-Grow. Thanks for telling your friends about our products and for sharing photos of your gardening successes. Grow your own vegetables, fruits and herbs using organic, all natural or nontoxic products. Use organic, all natural or nontoxic fertilizer and weed killer for lawns. When you can’t grow it yourself, buy organic. It costs a little more, but worth it. It also supports organic farmers. Let’s all be protective of our families and good stewards of the land, today and tomorrow. In the 1980’s, an Amish farmer began using Spray-N-Grow Micronutrients to treat his crops. Now, thousands of commercial growers use it because of scientific research results. Spray-N-Grow Micronutrients has been tested on 95 crops, in 11 states and 8 countries. Farmers know these proven results produce better crops and increase their profits! Visit spray-n-growag.com to read our research and to learn how Spray-N-Grow Micronutrients can increase your profit. Please contact Natalie at 800-288-6505 or email natalie@spray-n-grow.com for a personal crop protocol.